Obesity is a serious health concern in the United States and it is a growing threat to children, too. Due to sedentary lifestyles and poor dieting habits, more and more children are diagnosed as being clinically overweight every year, and an increasing number of these children are diagnosed as obese. Activity is important and it is incredibly beneficial to your overall health. By encouraging kids and teens to be active from a young age can help set good habits early on and will most likely help them stick with such habits as they get older. There are many ways to help foster and develop skills that will encourage activity, while making sure that your kids are healthy too. 1. Be a good role model. Kids learn a lot by example and they easily pick up on things that their parents do, especially when they are younger. 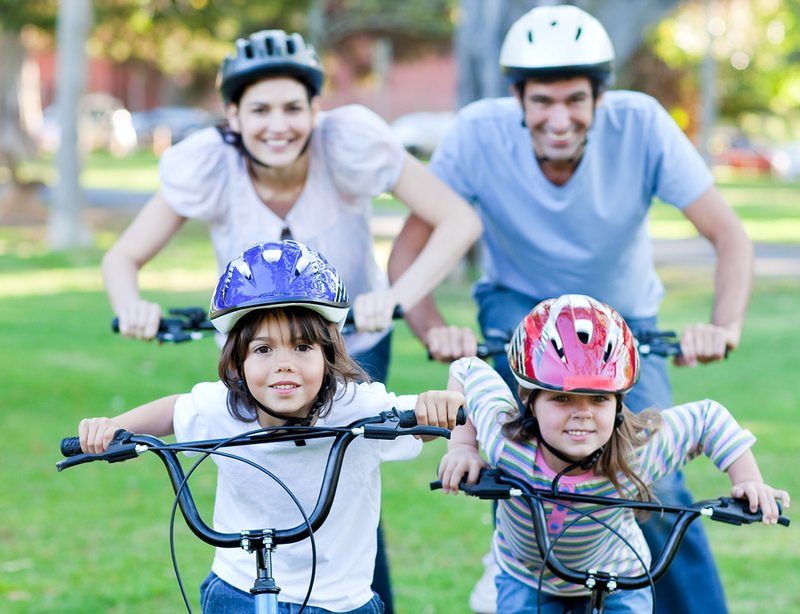 By being active yourself, your children are more likely to follow suit. 2. Be their cheerleader. Being positive or making activities fun can definitely be helpful. Many people, especially adults, see working out as a chore but if the idea of staying active is established and understood as a fun activity early on, this association may not exist and kids may be more likely to be and stay active. 3. Buy them “active play” gifts. Every kid wants a tablet or handheld device these days, but no matter what you end up getting your children for birthdays or during the holidays, make sure to get some things that encourage active play such as a bicycle, sports equipment, jump rope, etc. 4. Limit sedentary activities. You don’t have to be moving all the time in order to be fit, but with more and more people opting to sit in front of the TV or with a mobile device in hand, it can be easy to feel dissuaded from doing any other sorts of activities, especially ones that are more physically involved. Sure, it’s fine to watch a show, movie, or play a game, but it is important to limit screen time for a variety of reasons and can help open up opportunities for children to choose more active ways to pass the time. 5. Make time! And make sure there is time. Families are busy these days, and it can be difficult to schedule much of anything, but try to make sure that your family has some time to move around, too. Check in with your child’s school to see if they are active during the day and if there are any opportunities to participate in a sport or other active extracurricular after school as well. 6. Make sure that nutrition plays a role. Being active is important, but so is eating healthy, too! Make sure that your kids are hydrated, that they have access to healthy snacks and meals wherever they are prepared whether they are at home or at school. There are so many ways to better incorporate activity into a daily routine, and the more a habit is positively enforced the more likely it will stick. There are so many benefits to eating well and staying active, especially for children who are still growing and developing constantly. For more ways to keep kids active and creative parenting resources visit the KD Novelties blog.